# IE 6.0 after SP2 has no gzip bugs! # Sometimes Opera pretends to be IE with "Mozila/4.0"
Usually, when you develop new features, you split functions into pieces and implement them one by one. And in Java development, there will be implemented by one *.java file and another. If you want to deploy the finished feature, you need to pack them up. In Java development, deployment means that you need to pack compiled *.class files and other related resource files into a *.jar and place it to correct location. There are lots of tools to do this job. Or if you are using IDE, such as Eclipse, the IDE will provide a whole development life management tools for you. Small *.js file should be packed into some bigger *.js file. But each *.js file should not be too big, or each time you update only one small *.js, you have to update a big *.js file. But *.js files should not be too many. Because *.js files are downloaded from servers in some specific orders, two many *.js files may be queued, which may mean a long latency. Lots of *.js compiled from *.java by Java2Script compiler is very small. In order to get a shorter loading time, most of these *.js files are packed into a big *.z.js file. Please check out the packing ant script. But packing *.js into a big *.z.js is not a simple job in Java2Script. As there is ClassLoader inside Java2Script system. The packed *.z.js file must be dealt correctly by ClassLoader. This issue is very complicate. And I would like to talk about it in another post. “background-position:16px 32px;” means the icon place at the 2nd row, the 3rd column. That is the image packing trick. Java2Script SWT implementation uses these tricks, you can check the Shell.css. In there, there are no absolute positions but relative positions, such as “center right”. This is because 9 icons are packed as 3×3 squares. Small *.css can also be packed into a big *.css files too. But in practices of Java2Script packing, *.css files are packed into *.js files. All *.css files are only applied when necessary. For example, when a widget is loaded, the widget related *.css rules are applied to the page so that widget may be in correct style. For this trick, please check Java2Script CSS hacks. And there are also some other packing tricks which I may introduce later. As packing is for deployment. And deployed resources are for loading. And loading will affect the whole object oriented inheritance simulator. And things are a whole integrated system. In my early Java2Script development days, I think a lot about asynchronous programming. AJAX was hot and is still hot. What is most important factor in AJAX technologies? I think it is “Asynchronous”. Without asynchronous programming, visitors still need to waste their time waiting for browser to fetch the next page. What a bad user experience. In fact, asynchronous programming is not an easy work. Lots of callbacks, lots of threads, lots of locks or semaphores. All these stuffs may be messed up into an unmaintainable geeky thing. Actually, if there are tools helping to design and maintain such codes, it is not a big job. If you use Java, you won’t get stuck at those threads of synchronized locks, as lots of debug tools help you figure out how those things work together at any moment you want to take a look. In fact, there are lots asynchronous programmings in Java design patterns or codes. But in Java world, asynchronous programming is not an outstanding features, and it is seldom discussed as an important issue. In order to fulfill some complicate task, designers should design the whole architecture as asynchronous programming patter from the beginning. Even in Java language, all things in asynchronous mode are still difficult. More should be discussed for this issue. 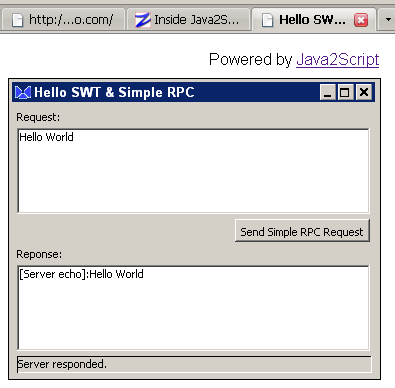 In this article, I will show you a simple example using Java2Script Simple RPC (For “what is Java2Script Simple RPC? “, please read this post). Later, I will explain more about every files. Step 3. Run as Java Application and Java2Script. Use context menu to “Run as” -> Java Application, and “Run as” -> Java2Script Application. You should get things work. Re-test the application in native Java SWT application mode. It should work as expected. 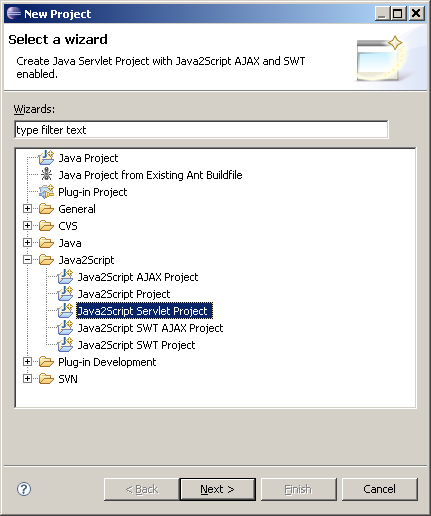 Select build.xml file, right click to bring up context-menu and “Run as” -> Ant Build, and then select the project and right click and select “Refresh” to refresh the project files, you will see a “org.java2script.demo.simplerpc.war” file. Now try to deploy this war file to a Java servlet container, such as Tomcat server. to deploy the above mentioned war file. But you haven’t finish deployment yet, because you still need to deploy Java2Script’s core *.js library files to the server. And “Run as” -> “Ant Build …”, select “pack.plugins.j2slib.war” in the “Targets” tab and “Run”. Then refresh the project, and deploy the “plugins.war” to Tomcat server. Here is the online demo of this Simple RPC example. If you are familiar with Java debugging, you must know there is a technology called “Hotspot“. One feature of Hotspot is to replace old classes bytecodes with a new ones that are generated by dynamic compilers. This feature helps developers a lot in debugging. That is to say, when a developer load a very complex application in debugging mode, he want to modify the sources a little, he can just do it, the compiler will compile those related classes and notify classloader to load those affected classes bytecodes. And the modified codes are on effects. It saves lots of time by avoiding closing, reopening and waiting big applications again and again. This is very convenient when comparing to those static compiled applications written by C or C++ languages. By using Java2Script’s SimpleRPC, there are no needs to know RPC (Remote Procedure Call) and no needs to know Java Servlet or J2EE! Only knowing developing Java desktop application is enough for developers. Here is magic. Java2Script recommends writing applications in desktop ways. This means that all logics are developed in one container. But when you want to deploy the applications in a Browser/Server mode, you have to tear your applications into server logics and client logics. And to integrate logics between server and client, you need to transfer the datum, which you may be required to know how to wrap and unwrap data. This transformation and wrapping is the essence of RPC. Java2Script also does the above wrapping for you, so you have no needs to know RPC wrapping. And Java2Script uses threads to simulate the remote J2EE server in local mode, so you can see no remote server and you can debug your logics smoothly as Eclipse JDT provide a very smoothly debugging experience for threads. As in normal J2EE server, each request is stateless. In such a way, Java2Script’s SimpleRPCRunnable instance (for Java local Thread) should be designed as a stateless instance. 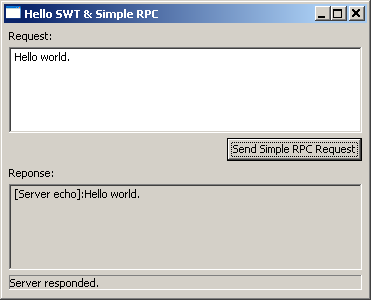 For more details about SimpleRPC, such as why not using Java’s RMI,? Java’s serializations, or JSON’s RPC, please keep tuned for the later articles. I know that there are lots of differences between normal web applications and desktop applications. But developing desktop applications is a lot faster than web applications, there is no needs to care about HTML, CSS, or HTTP server and database server. So developing desktop applications is much easy for most of developers. And it will also increase the speed of new products. You know speed is one of the most important factor of new web applications. So desktop applications to web applications converting is an acceptable way for web applications. In simple, Java2Script is providing tools not libraries. Here is ClassLoader summary inside ClassLoader.js, for more information, please also read the ClassLoader source. ClassLoader creates SCRIPT elements and setup class path and onload callback to continue class loading. to provide information to build up the class dependency tree. In IE, loading *.js through SCRIPT will first triggers onreadstatechange event, and then executes inner *.js source. In Firefox, loading *.js will first executes *.js source and then triggers onload event. of optional classes, which also be loaded before being called. The class loading status will be in 6 stages. Unknown, the class is newly introduced by other class. Known, the class is already mentioned by other class. Loaded, *.js source is in memory, but may not be initialized yet. It requires all its must-classes be intiailized, which is in the next stage. Musts loaded, all must classes is already loaded and declared. Declared, the class is already declared (ClazzLoader#isClassDefined). Optionals loaded, all optional classes is loaded and declared. The ClassLoader tries to load all necessary classes in order, and intialize them in order. For such job, it will traverse the dependency tree, and try to next class to-be-loaded. Sometime, the class dependencies may be in one or more cycles, which must be broken down so classes is loaded in correct order. SCRIPT is loading asynchronously, which means controling order must use callback methods to continue. Multiple loading threads are later introduced, which requires the ClassLoader should use variables to record the class status. Different browsers have different loading orders, which means extra tests should be tested to make sure loading order won’t be broken. Java2Script simulator itself have some loading orders that must be honored, which means it should be integrated seamlessly to Clazz system. Packed *.z.js is introduced to avoid lots of small *.js which requires lots of HTTP connections, which means that packed *.z.js should be treated specially (There will be mappings for such packed classes). *.js or *.css loading may fail according to network status, which means another loading try should be performed, so ClazzLoader is more robust. SWT lazy loading is later introduced, which means that class loading process may be paused and should be resumed later. If you are familiar with or experienced in writing a book, please share your thoughts with me. Thanks. 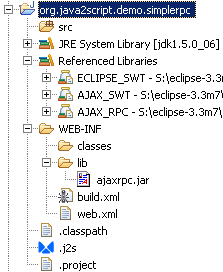 One feature that I like Java2Script is its full integration with Eclipse JDT’s incremental building. Java2Script reuses Eclipse JDT to compile *.java into *.js. As Eclipse JDT supports incremental building, so Java2Script also supports this feature. The magic is that when a *.java file is passed into JDT’s ImageCompiler, it is also passed through Java2ScriptImageCompiler. To understand JDT’s incremental building, when a *.java is modified and compiled, this file will be compiled, and as always, this modification may affect other *.java files, that is to say, some other classes may need recompiling. JDT uses some algorithms to figure out those delta *.java and compile it, and compiling continues until there is no affected files that need to be compiled. As compiling has its entry, Java2Script just install an extra compiler at the entry so that a *.java file is compiled into *.class, it also be compiled into *.js. This is? the whole magic of Java2Script builder. 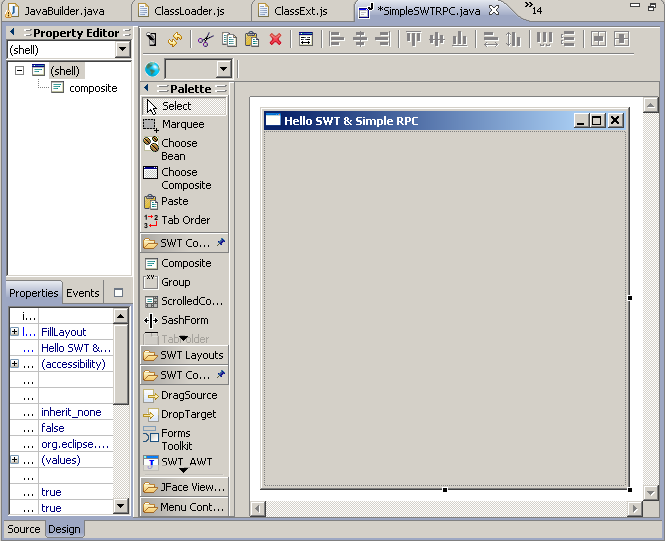 But to inject a Java2Script compiler into existed JDT plugin requires some works. First JDT’s compiler is not designed to be injected. Modified the JDT sources and recompiling the plugin do works. But it’s not quite suitable for public, as it need to overwrite original JDT plugin jars. There is another factor that make a little difficult in implementing Java2Script compiler based JDT. A lot of classes in JDT are package accessible or their methods are not public. It need a lot of works to do so that those restricts can be avoided. And besides, Java2Script compiler codes must be maintainable, or when a new Eclipse version is released, all those hard works need to re-do. 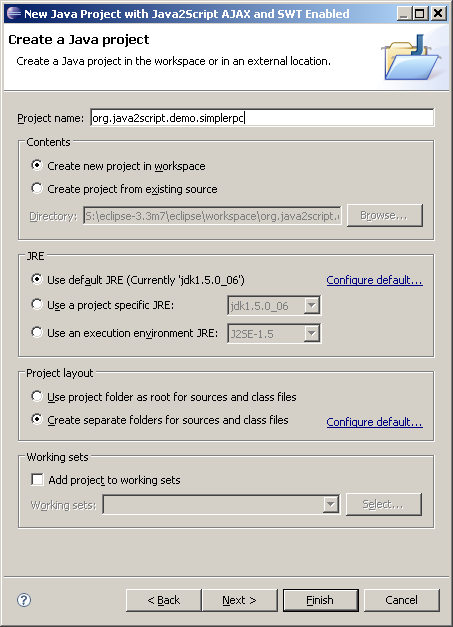 In current Java2Script compiler, it reuses codes in package org.eclipse.jdt.internal.core.builder. All it need is to move all the sources into a new package named net.sf.j2s.core.builder. And some new proxy classes or new inherited classes are added so it is possible to access inner data structure. And Java2ScriptImageCompiler is injected into those JDT normal compiling process. And there are some tricks here. To convert some instances between two different classes without trigger ClassClastError, one instance (e.g. net.sf.j2s.core.builder.State instance) is serialized into DataInputStream first, and then it will be de-serialized into another instance (org.eclipse.jdt.internal.core.builder.State.). In all, in implementing Java2Script compiler, it use all kinds of tricks to expose JDT’s inner data structures to outside compilers.